Scientists have developed a new biological tool for examining molecules - the building blocks of life - which they say could provide new insights and other benefits such as reducing the numbers of animals used in experiments. The University of Leeds in collaboration with Avacta Life Sciences, a Leeds spin-out company has developed tools, called Affimer technology, which can replicate the work of animal-derived antibodies traditionally used to help study biological molecules and processes. Like antibodies, Affimer technology can bind tightly to a target molecule to help scientists study its actions. However, Affimer proteins are superior in being more robust, smaller, easier to modify to suit different applications and more specific to the target of interest. Research published today in the journal eLife explains how Affimer tools can be produced in a matter of weeks, rather than the many months it can take to create a high quality antibody. Dr Darren Tomlinson, from the Astbury Centre for Structural Molecular Biology and BioScreening Technology Group at the University of Leeds, said: "Molecules are notoriously difficult to study and therefore tools are required that allow molecules behaviour to be studied indirectly. Such tools, like Affimer technology provides an easy and more reliable way to track molecules movements and study how they react to different stimuli which will make the study of diseases they can cause much easier." For many years researchers have used animal-derived antibodies to indicate the presence of biological molecules and to study how they work. While for a long time these were the best available option, the reliance on animals to create them, and difficulties in producing batches of antibodies which behave in the same way has proved problematic. The Affimer tools developed by the Leeds-led team, led by Professor Mike McPherson and Dr Tomlinson, supported by researchers from Avacta Life Sciences, the Rutherford Appleton laboratory, Pirbright Institute, Defence Science and Technology Laboratory and the Oxford Protein Production Laboratory is an example of the emerging method of creating 'alternative binding proteins' which replicate the work of antibodies using lab created tools. The team showed that the Affimer technology worked well in a wide range of different routine procedures in which antibodies are normally used by scientists. They found it produced similar quality results and, in a new technique called 'super-resolution microscopy' its smaller size meant scientists were able to look more closely at what individual molecules were doing. The ability to develop the Affimer tools without relying on animals also helps to reduce the number used in research work, an example of the University's commitment to finding new ways to lower the number of animals involved in scientific studies. The University of Leeds is a signatory to the Concordat on Openness in Animal Research run by Understanding Animal Research and supports the National Council for the Replacement, Reduction and Refinement of Animals in Research. Dr Tomlinson added: "Affimer tools are more reliable than animal-based antibodies and as they are made in the lab and not through the use of animals we have created a scientifically-sound and animal friendly alternative for researchers to use. "Animals play a vital role in research which helps us learn about life and disease processes, but advances in scientific procedures mean there are in some cases alternatives to using them, or using them alongside new methods, which is pleasing." "Affimer tools are much less complicated and more stable than antibodies", said Dr Christian Tiede, first author on the research paper which covers its development. "They can easily be adapted for a wide variety of uses; together with antibodies, they provide important tools in biology, biotechnology and medicine." 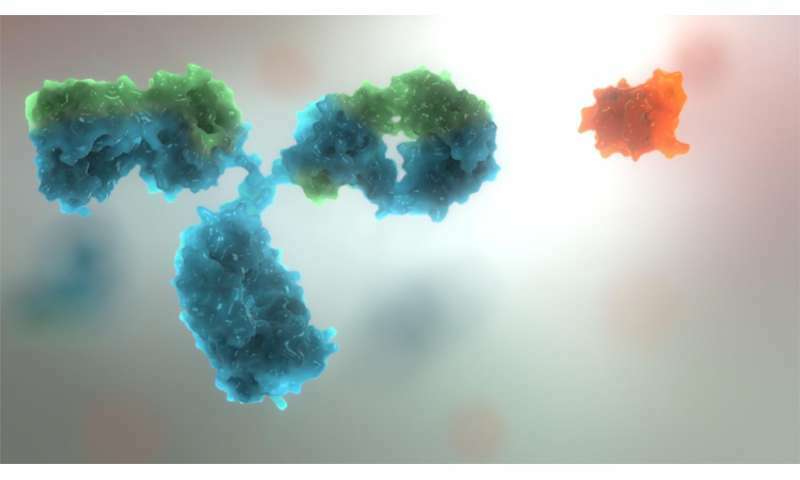 Antibodies are large complex proteins and often need to be produced in animal cells and are used to locate and monitor the interactions and activities of molecules inside cells. They are made by injecting an animal with the molecule which scientists wish to study; the animal then produces antibodies which circulate in their blood, and that attach themselves to the molecule. In order to study the molecule, the antibodies are extracted from the animal's blood and purified before being used as tools in experiments. They can also be useful in diagnostic tests to help identify diseases. Affimer tools being made by the University of Leeds and Avacta Life Sciences teams are much smaller, more stable and simpler in chemical structure than antibodies. They are made in the laboratory rather than using animals which allows their properties to be more tightly controlled to suit a particular application. Affimer proteins have a binding surface area similar to that of an antibody and are therefore able to strongly bind the target molecule of interest so that it can be quantified or its activity studied. They can be adapted for a wide range of uses.